Hello again! 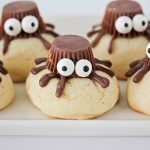 It’s Alicia from The Baker Upstairs, and I am so excited to share one of my very favorite cookie recipes with you today! These oatmeal raisin cookies have the best flavor and texture, and they are so delicious that you won’t be able to stop eating them. They are so good! My mom likes to tell a story about me from when I was two years old and saw a small patch of blue amid a cloudy sky in the middle of winter. I was very confused and kept asking, “What’s that?” while looking up at the sky. It had been so long since I had seen a blue sky that I had actually forgotten that they existed! Somehow even now, decades later, I still feel about the same every winter. There always seems to come a time when it has been gray outside for so long that I can hardly remember sunny skies. One of the things I’ve found that always helps to brighten up the gloomy winter days is to bake something delicious. When there’s something delicious in the oven, and the house is cozy and warm, suddenly it doesn’t seem as cold and desolate outside. I’ve been baking these oatmeal raisin cookies on repeat this winter, and they are perfect for brightening up the days! We love to eat them with a warm cup of cocoa, often while snuggling on the couch and watching a movie. When summer comes and the house is too hot to heat up the oven for cookies, I’ll look back on these cold winter baking days fondly! I know that raisins often get a bad rap (although I love them! 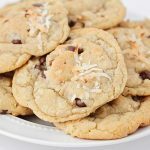 ), so if they’re not your favorite, you could easily substitute dried cranberries or chocolate chips in these cookies instead. I really think any kind of dried fruit would be delicious in these cookies… I’m already dreaming of making a dried mango and coconut version. Yum! 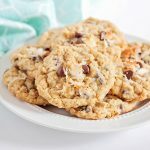 These cookies are made with pantry staples, which means they are easy for me to make anytime the craving strikes! 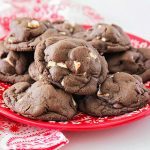 I always use my KitchenAid mixer to make cookies (mostly because I’m lazy), but you could easily make these with a hand mixer, or even just mix them by hand. 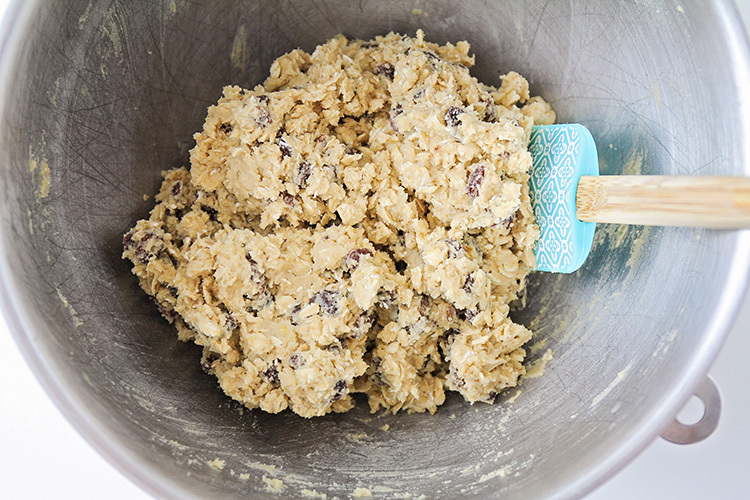 The dough for these oatmeal raisin cookies is honestly some of the best tasting cookie dough I’ve ever had! As hard as it might be, try to make sure that at least some of it makes it onto the cooking sheet. Trust me, they taste even better after they’re baked! I used a 1 1/2 tablespoon cookie scoop for my cookies, but you can certainly shape them with a tablespoon or teaspoon instead (depending on what size of cookies you like). Bake the cookies until they’re golden brown and crisp on the outside. They’ll be pretty soft when they come out of the oven, so it’s a good idea to let them sit on the baking sheet for 10 minutes or so before moving them to a cooling rack to cool completely. 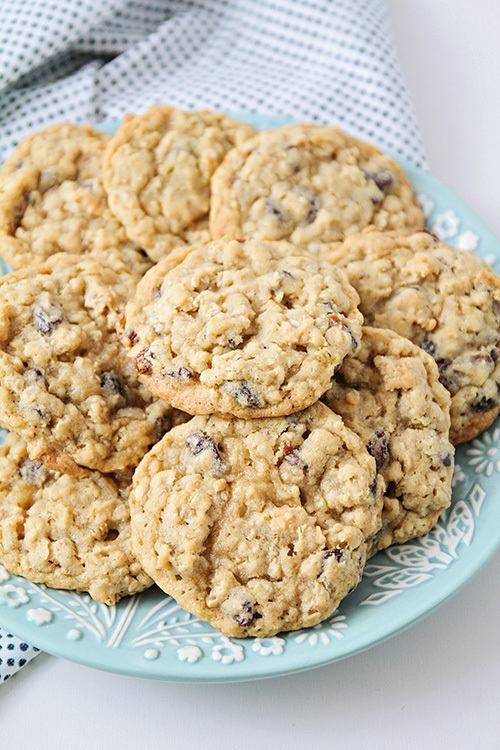 These oatmeal raisin cookies taste absolutely amazing! 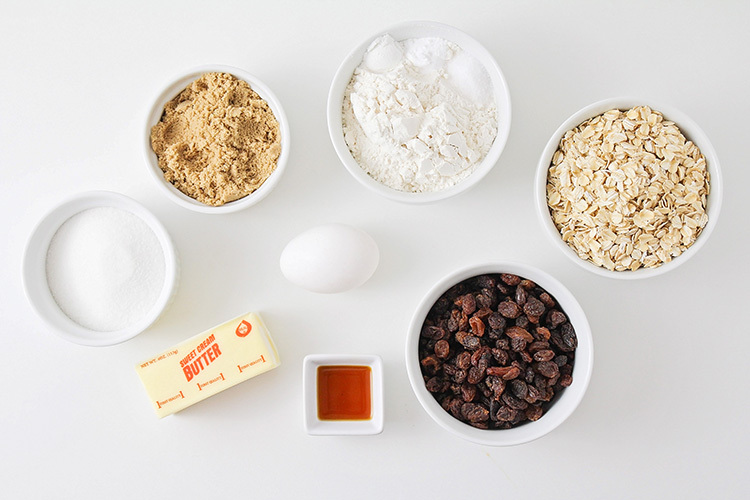 The combination of sweet and plump raisins, oatmeal, and brown sugar is totally irresistible. I absolutely love the texture of these cookies. They have the perfect balance of crispness and chewiness! The cookies will stay fresh for several days, so they are perfect for packing in lunch boxes, or even sending to friends or family far away. 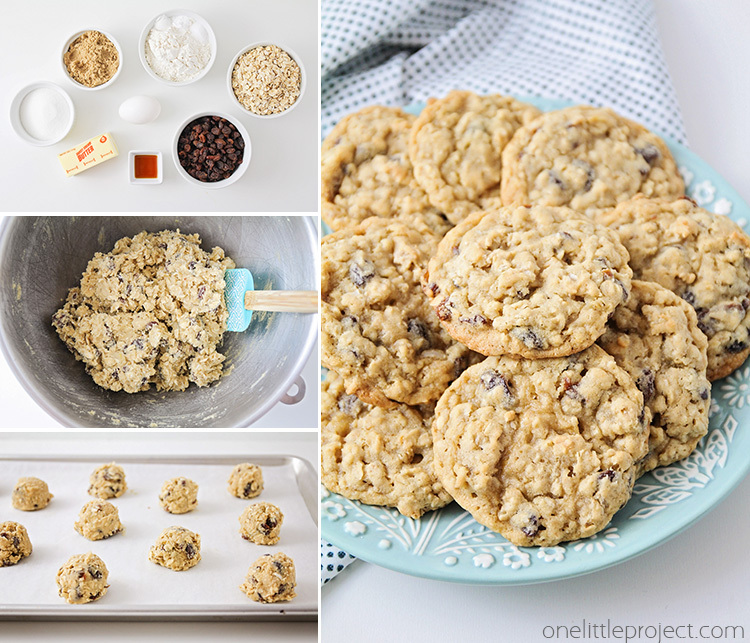 These oatmeal raisin cookies are one of my favorite treats, and my whole family loves them too! They seem to disappear almost immediately every time I make a batch, so I often double the batch and save the extras in the freezer for when I need a cookie. I just stick them in the microwave for 10 seconds or so to soften them up, and they are perfect for satisfying my sweet tooth. 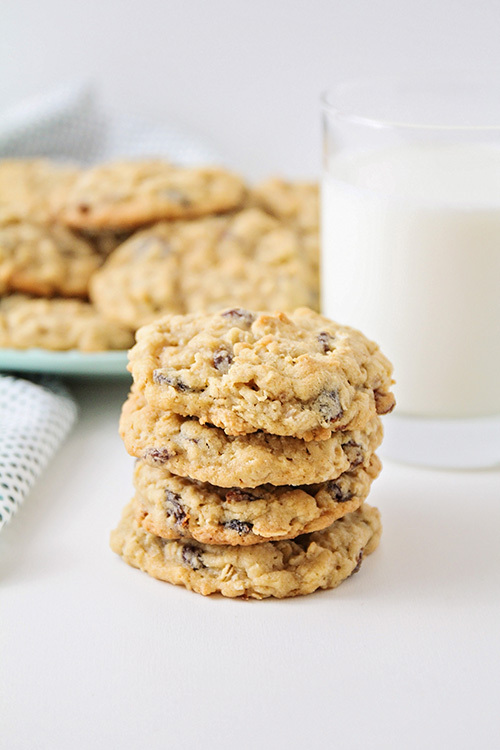 These chewy and sweet oatmeal raisin cookies are easy to make and perfectly delicious. A classic cookie that never disappoints! 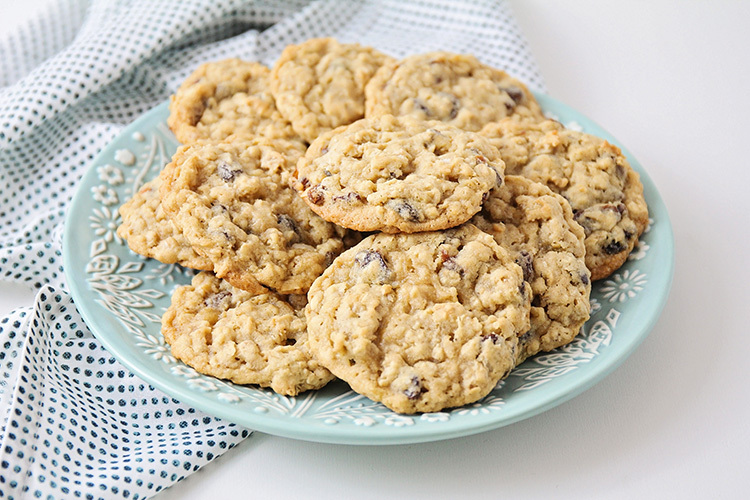 Oatmeal Raisin Cookies - Chewy and Sweet! In a large bowl or the bowl of a stand mixer, cream together the butter, brown sugar, and sugar. Add the egg and vanilla, and mix well. Add the baking soda, baking powder, salt, flour, and oats, and mix until just combined. Fold in the raisins. 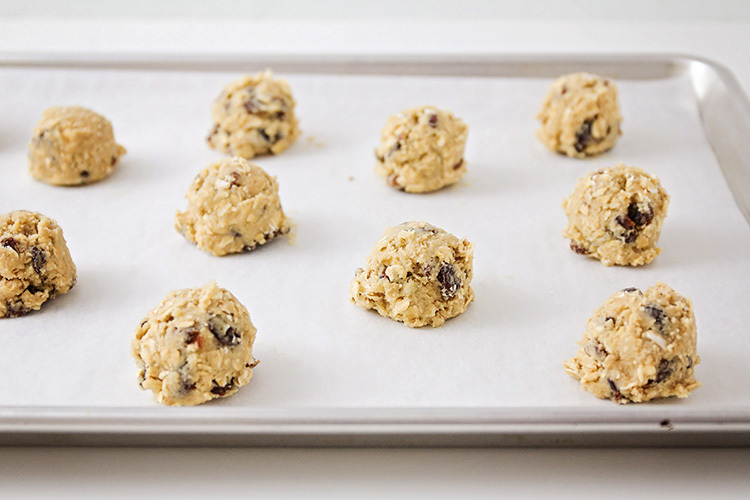 Scoop the dough in one inch balls onto a lightly greased baking sheet, and bake 10-12 minutes, or until lightly browned. Let sit for 5-10 minutes before moving them to a cooling rack.